I know the pair, not only by their costumes, but because I had attended middle and high school with both of them. I had seen Jessica Conley and Dustin Franklin’s relationship begin in high school and recently congratulated them on their marriage. 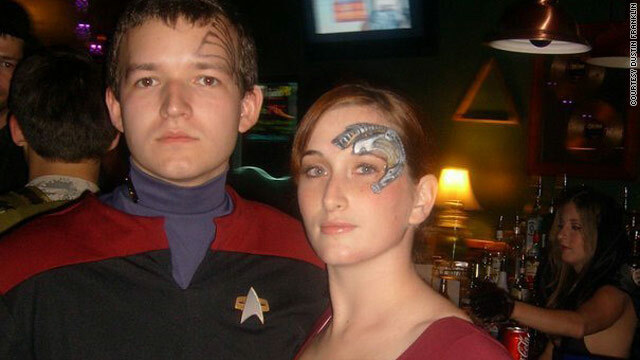 In high school, Jessica didn’t like Star Trek; Dustin was the ultimate Trekkie. As their relationship deepened, Dustin introduced her to the various Star Trek series. "Voyager" became her favorite, which is one of the reasons they attended Mulgrew's panel. After asking Mulgrew a question, Jessica returned to her seat. Dustin was beaming at her, and I could almost feel the pride emanating from him. Then, it hit me - unlike in high school, they both spoke the same language now. The entire panel was rife with these moments, the kind that made you want to clutch your heart. From the 4-year-old girl that approached the microphone just to say she spelled her name “K-a-t-h-r-y-n” to the retired naval officer who said, “You really set the stage for all of us female captains,” I noticed a recurring theme. Star Trek pulled me into its clutches the first time I heard William Shatner say: “Space: the final frontier.” I remember a chill, the good kind, going down my spine. But I wondered, what drew in the countless other fans to this voluminous franchise? I had the epiphany that we were all speaking the same language. We loved being a part of this great, shared interest in something that was much, more more than a "space opera." Here, at this panel, I had a glimmer of understanding outside of my own passion. It was love. The room was filled with it, from Mulgrew’s charming interaction with the fans to the shared moments between attendees. It was even present between Mulgrew and her character, Janeway. This is one of Star Trek’s intrinsic features that keeps the fans coming back. “I was relatively ignorant about Star Trek,” she said at the panel. “I walked into Janeway fresh. She became mine - that was my marriage, that was my love affair. I gave her what I thought she needed. Then, this wonderful thing, this relationship, between myself and the fans happened. What is it? It’s exalted, it’s dignified, it’s unusual. For 45 years, Star Trek has aimed to go where no franchise has gone before, with possibly the only exception being "Dr. Who" (which began airing in 1963). Six television series, eleven feature films and countless novels carry the bulk of the franchise, not to mention gaming, fan fiction, organizations and conventions. While a reboot film, released in 2009, sparked new interest in Star Trek and created a new generation of fans, there are those who enjoy it for a specific part, and nothing more. In the mid-70s, Brandt Heatherington discovered reruns of the original Star Trek series on TV. He remains an original series purist today. It’s a chance for like-minded people to come together and collaborate on philanthropic projects across the globe, rather than just comparing Star Trek's Utopian ideals to Plato's "Allegory of the Cave" or Joseph Campbell's modern hero myth. Because they like optimistic science fiction, it would stand to reason that these fans want to help out through a greater cause. “People join an organization like this that have a purpose about them,” he said. As one who works in an organization that supports over 4,000 fans, Heatherington doesn’t believe in the stereotypical Trekkie because he’s never encountered one, which begs the question, just who are Trekkies? Or is it Trekkers? In 2010, anthropologist and pop culture researcher Daryl G. Frazetti provided an online survey about Star Trek fandom. His aim was to understand the “misunderstood, misrepresented culture” of Trek Fans. After receiving 5,041 individual responses, Frazetti discovered that 43% of fans refer to themselves as “Trekkies,” (the term Gene Rodenberry himself created) rather than Trekkers and that 57% of fans were female. But even more fascinating about this fan culture that has created a template for other fan cultures to follow was their motivation for being Trekkies. An overwhelming percentage of those surveyed said they participated as fans because of Star Trek’s ideals and the friendships that sharing those ideals created. After all, 98% said that the best part of Star Trek were the friendships they began with other like-minded people. When Mike Miller, a fan who discovered a love of Star Trek at six years old in 1967, attended William Shatner’s panel at Dragon*Con, Miller was excited to learn that the actor wanted to produce a documentary on Star Trek fans. Although this has been done before, Shatner wanted to show what he has come to know: that the fans go to conventions not just for the celebrity interaction, but fundamentally to connect with one another. Garrett Wang, who played Ensign Harry Kim on "Voyager" for seven years, believes this to be true as well. As director of Trek Track at Dragon*Con for the last two years, he’s seen how fans come together and continue to celebrate the ideals Gene Rodenberry endorsed. Standing in line for the Miss Star Trek Universe Pageant, I was surprised to connect with so many "Star Trek: Deep Space Nine" Fans. They, along with Miller, liked the dark atmosphere of war in the series and the duality of its characters. It provided a purpose and like well-composed science fiction, emulated real life better than any reality TV show. During the "Deep Space Nine" panel at Dragon*Con, Nana Visitor spoke about the duality of her character, Bajoran Major Kira Nerys. Fans grappled with whether Kira was a freedom fighter or a terrorist, and Visitor suggested that had the series been produced post-9/11, her character may not have existed due to the tense and sensitive nature of her identity. "DS9" also broke ground as having the first African-American captain, much like "Voyager" challenged societal expectations by placing a woman in command. Star Trek is bold in many ways. Over the years, the franchise has continued to pursue Rodenberry’s vision, by conquering race, gender and greed to achieve a Utopian ideal. It emulates real life, and perhaps the most fantastical part of this science fiction is that it encourages us to do better. The hope lovingly contained within Star Trek’s shows, movies and novels remains an optimistic heartbeat for future generations. Throw in another movie, which begins filming in January according to John Cho (via a conversation with Garrett Wang), and the franchise will only gather more steam. “Some science fiction is just made-up stuff without much to say,” Heatherington said. “When you’re done with it, you shut it off. Star Trek stays with you after you turn the TV off or leave the theater. It makes people think. You like something that makes you think after you’re done with it." Star Trek is good when it comes to psychological therapy as it was pointed out, as well as bringing up social problems and such. In fact, one of my favorite arcs is the DS9 episodes when Nog joins Starfleet, gets wounded, and his recovery. This resonants especially now days after 9/11, with people joining the service to do better things, get injured, and the challenges after. It kind of gets freaky when you think of the comparisons. If I had to choose only one sci-fi series to watch for the rest of my life, it would be Star Trek. I'm a fan of many sci-fi shows/films like Dr. Who, Battlestar Galactica, Star Wars, etc., but hands down my number one favorite has been Star Trek. While not every episode or film was great, I enjoy the entire series and the genre. I look forward to a new Star Trek film and hopefully a new Star Trek TV series someday. Odd that you don't mention Stargate, It would be difficult for me to pick between the two. Both are highly imaginative, and both are more then the typical shot em up. As a lifelong Star Trek fan... yes, this is why we keep coming back.